When your flooring is looking a little tired and worn call in the experts to restore the shine. GCD Restoraion offers floor cleaning in San Francisco that's a worthwhile alternative to trying to clean it yourself. Property owners, both commercial and residential, often choose flooring because it requires less maintenance and cleaning. That doesn't mean however, that it will never need to be done. Regular foot traffic and dirt, dust and grime, will eventually lead to a dulling of the flooring whether it's tile, slate, stone, vinyl or laminate. You can hire basic equipment and over the counter cleaning products but you'll likely be very saddened with the results. Professional floor cleaning in San Francisco is a much more cost-effective option and it'll save your free time for doing more enjoyable things. Our San Francisco floor cleaners have a number of different methods that they can use to get your floors looking great again, depending on their composition. Wooden floors can be sanded right back, and then stained and varnished or painted or we can give them a surface clean and polish. 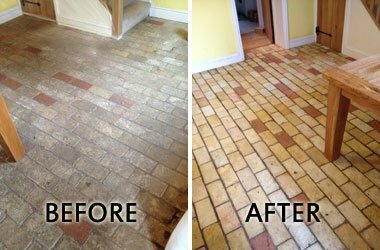 Stone, slate, concrete and tiled floors will benefit from high pressure cleaning, which removes dirt that becomes embedded in even the tiniest imperfections in the surface of the floor. We’ll then apply a sealing coat to keep the floor looking great for longer. Vinyl floors in commercial properties are cleaned with low pressure, heat and emulsification leaving them clean and hygienic. Booking us to carry out this service on a regular basis can also help to extend the lifespan of the floor. Whether you need floor maintenance or cleaning, give us a call because we've got a team of highly trained experts who can quickly and effectively bring the shine back to your floors. Whether you have stone, tile, slate, vinyl or laminate flooring makes no difference, because we have in our cleaning arsenal the best equipment and supplies in the industry today. Our staff have been carefully vetted and are insured to provide you with total peace of mind when we're working in your home.